At the 2006 Consumer Electronics Show Cobra Electronics introduced a line of new radar detectors which, among other things, claimed to detect Ku band. Ku band? Cobra's announcement had the competition scratching their heads. Nobody in the industry was aware of the arrival of a fourth radar band (frequency). Ku band is a European frequency centered at 13.45 GHz, slightly above the ancient X band and well below K band (24 GHz) and Ka band (33.4 to 36.0 GHz). These three bands remain the only U.S.-authorized frequencies available to police radar here. No domestic manufacturer has ever produced a Ku-band radar and, based on recent conversations with their chief executives, none has the slightest interest in doing so. One manufacturer in recent years did consider Ku band for European sales. Government regulatory moves in the UK dramatically reduced the maximum allowable power output from police radar, effectively making this U.S. manufacturers' wares impossible to sell there. 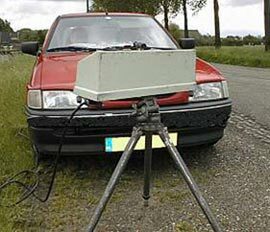 (Photo radar, with its ultra-low power output, and lidar (laser) remain their tools of choice for traffic enforcement.) For that reason, MPH Industries, one of the oldest U.S. radar companies, built a prototype Ku-band radar to see if it would address the European problem. After an evaluation, it was decided to use a modified Z-Series model instead. But it is a K-band unit. I examined one of these, dubbed the Z-45, at the International Association of Chiefs of Police annual conference in Boston. The company had it on display to test domestic reaction, which proved to be underwhelming. MPH executives expressed no interest in releasing any type of Ku-band radar in the U.S. In this country Ka band is the most common frequency and no business case can be made for dialing back the clock to produce an unwieldly Ku-band radar that no police department would buy. Worldwide, only two models of Ku-band radar have ever been produced in quantity. 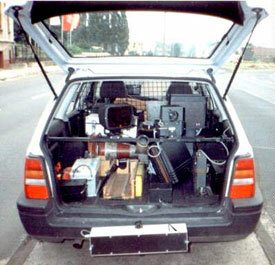 Some Ku-band photo radars were produced by French radar manufacturer Sagem in the 1970s and early 1980s. The other model was also a 1970s photo radar, the TraffiPax Microspeed 09 Type 5. One Ku-band radar was imported to the U.S., in 1990 for a test, then returned. The first person to suggest that Ku-band radar may be about to appear in the U.S. was Carl Fors, who formerly did business as Speed Measurement Labs or SML. Aside from being the first to make this claim, Mr. Fors was also been the most vocal in repeating it, mostly on his website Speedzones.com. With Mr. Fors as her source, assistant editor Amy Gilroy wrote in the August 8, 2005 issue of TWICE magazine (This Week In Consumer Electronics) that "...one police radar gun manufacturer is producing a prototype of a new Ku-band radar gun at 13.45 GHz, which could lead to police use of Ku guns as early as September of next year ." Mr. Fors worked as a consultant for Cobra Electronics. According to a previously reliable, authoritative source he approached Cobra management in 2004 and convinced them that it could be made to appear that Ku band is coming to the U.S. Looking for a competitive edge, Cobra incorporated Ku-band into their new models and hinted that the threat was real. Mr. Fors was the source of similar controversies. In 2001, on his Speedzones.com Web site he began warning of the arrival of a new radar detector detector called the MR5. He also wrote stories about the MR5 for law enforcement publications. In his story "Detecting Radar Detectors", appearing in the November 2001 issue of Blue Line, a Canadian law enforcement magazine, Mr. Fors warned that "Terrorists could be using radar detectors to avoid police scrutiny" and "...according to research of the Insurance Institute for Highway Safety and Speed Measurement Labs, Inc. (SML) ...detector drivers travel on average 5-7 mph faster than drivers without the device." Mr. Fors wrote: "Two companies have announced new detector/detectors that received the new lo [local oscillator] frequencies of radar detectors. Stealth Micro Systems of Australia is marketing their Stalcar RDD and Microwave Concepts of Boston has introduced their MR5." According to State of Massachusetts and Suffolk County public records, the "Microwave Concepts" company name was fictitious. Mr. Fors also failed to disclose that the MR5 was his own product, the prototype having been made at his direction by an engineer working for a radar detector company. Perhaps also coincidentally, Mr. Fors at the time was working for a company with a name remarkably similar to Microwave Concepts. This is Applied Concepts, makers of the Stalker brand of radar. And in the only known photo of the MR5, it uses the same antenna mount supplied with Stalker radar units. In his Blue Line story Mr. Fors reported that "...almost identical results were gained when using the Stalcar RDD as reported by the O.P.P. [Ontario Provincial Police.] ...The Stalcar RDD and the MR5 performed as advertised detecting and reporting all, old and new, radar detectors even those detectors claiming detection invisibility." When we spoke with him, constable Cairns remembered it differently. According to Cairns, the OPP traffic coordinator, Chris Whaley, provided a quantity of different radar detectors and they performed a bench test before leaving the office. It was found that the MR5 was unable to detect several widely-sold, current-model radar detectors even at point-blank range. Cairns also said that when out on the road, the MR5 had extremely low audio volume, making it difficult to identify vehicles. It also had very poor range. "Fors was pushing it [the MR5] really hard," Cairns said. "But it wasn't a very good unit. It looked like an older model BEL detector that'd been re-tuned to detect other radar detectors." After the OPP expressed no interest in his MR5 and U.S. buyers failed to materialize, Mr. Fors removed all mention of the device from the Speedzones.com website. Shortly afterward a new RDD, this from a one-man Austin, Texas skunkworks, appeared on Speedzones.com. It's unknown if Dallas-based Mr. Fors was acquainted with fellow Texas resident Heinrich Otters, who does business as Hill Country Research. However the HRC model is the only RDD to be displayed prominently and have its virtues described at length on Speedzones.com. Like a lot of rumors, the Ku-band flap seemed a little too coincidental to be real. Now we know why.